GDTâ€™s are special type of gas filled tubes used for wide range of electronic/electrical circuits for providing protection against lightning and other power surges.Â These tubes basically has two electrodes that are kept inside a gas filled closed envelope. In case of electronic applications, the container is mostly ceramic in nature. For high grade electrical applications military tubes are used. The electrical characteristics of this tubes depends on the pressure and composition of gas, and the distance between the two electrodes contained inside. The most commonly used gases in GDTâ€™s are given below. 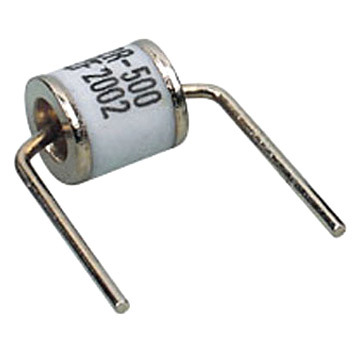 An image of a ceramic discharge tube is shown below. Take a look. There will be conduction inside the GDTâ€™s due to ionization of gas molecules. Each GDT have a specific voltage and current rating. 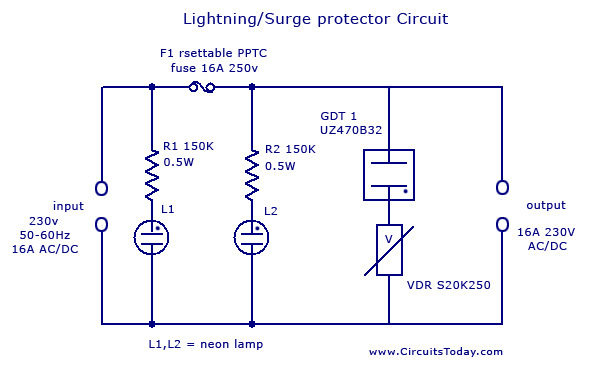 A simple lightning protector circuit is given below. The basic surge suppression circuit shown below consists of a VDR** (Voltage Dependent Resistor) and gas surge suppressor (GDT) connected in series. The protection circuit is connected between live and mains lead. Normally no current flows through GDT and VDR1. WhenÂ Â the voltage between the terminals is higher than the sum of voltage ratings of GDT and VDR1 (here both GDT UZ470B and VDR S20K250 has 250v 16A rating), current starts to flow through those components. If more the voltage rises then more current starts to flow through GDT and VDR1.When the current is normal, the circuit is reset and resumes itâ€™s functioning. Thus the current cannot be raised much over that predetermined value. When the voltage again goes back to normal values G1 and VDR1, the conducting stops and the circuit remains normal. Â If the flowing current is more than the specified value of main self-resettable fuse, the fuse will break and the circuit will be protected. After the current is normal, the fuses resets and continue its functioning (protection against short circuit and overload). The circuit is designed to protect sensitive electronic devices against overvoltage transients in normal mains voltage and overload/ short circuit. Two neon pilot lamps are also provided with the circuit diagram to show the status of input and load supply. Very good article. Tks. I tried to find the GDT UZ470B32… However, I not found. Could you tell me to one GDT or an equivalent circuit to protect a power supply of 90 – 240VAC / 12DC 24Watts? very useful article for elctronic system designers. Thank you. Is the Gdt a surge arrester? If not, can I use a surge arrester instead? This is Nick ,we are manufacturer of GDT ,GDT is a type of surge arrester.